You can’t stop watching For All Mankind. It’s not that it is too engrossing (it is) or that it is too absorbing (it is), but it breaks the immersion. For All Mankind has a flow, a beautifully crafted pacing created with expertly edited footage taken from the Apollo missions that landed on the moon. It’s an odd documentary that features numerous astronauts narrating with their own thoughts on the missions, yet they are never seen or identified. That is proper, selling the nature of the film which is not about the technology or the astronauts, but of human accomplishment and the humbling nature of flying in space. It’s about replicating the experience of being on the moon however that can be done via a film reel. Al Reinert directs although this is not so much direction as it is selection. NASA took this footage as a precautionary measure, not for the art. The images however are astoundingly powerful, more so than any visual effects could ever hope to recreate. Getting into the film, from the first time the astronauts of Apollo 11 are strapped in to the moment they leave the lunar surface is an adventure. The multitude of footage, from inside the closed quarters of the shuttle to the astronauts playfully jumping on the moon feels so intimate as to be there. This is incredible footage, especially considering this had more to do with tech support than anything else. Seeing the Earth at such staggering altitudes is mesmerizing. At one point, the astronauts pick up on the flames of a tribal ceremony in Africa while slowly leaving the gravitational pull of the Earth. Those tiny flames mean so much on the surface, yet are mere specks from space. These are sites few humans will ever see live, yet For All Mankind brings a portion of that experience home to ground level. This may be the best film about space ever conceived purely for its effect. Watching, listening, or reading interviews with the men who landed on the moon is impressive, but nothing compares to the visual splendor of actually seeing it. This is a grand experience, more incredible and awe-inspiring than anything created by Hollywood because you can almost feel like you are up there, weightless and ecstatic at seeing these sights. Everything here is pulled from the NASA archives or the broadcast footage. It is important to note that unfortunately, what was famously broadcast into the homes of millions back in 1969 looks like it did then. Much of the lunar surface footage was taped, and the awfully low quality (around the 55:00 marker) is disappointing after seeing the clarity of the images captured from the shuttle. It’s not like there is another piece of film that could have been found; nothing else exists besides the tape. Nearly every type of film stock seems to be in use here, from the small 8MM used in the cabin, the 16MM for some of the control room scenes, and 35MM sporadically throughout. The film opens with John F. Kennedy’s famous speech, the shot of the president at 1:46 the cleanest, clearest, and sharpest footage you’ll likely see of the man. Colors are naturally bright and clean, while the AVC encode resolves the variety of grain structures. The film stocks were supposedly frozen in the NASA archives, hardly every featuring a single scratch or imperfection. In fact, the only time damage becomes an issue is the rocket on the landing pad at 7:00. This is a familiar sight and undoubtedly was used countless times as stock footage. While true high fidelity detail is at a premium, appreciating the images is easy. The instrument panel at 21:02 is marvelously defined despite the healthy grain structure. Shots near Earth, which are numerous, are stunning in their beauty and detail. One of the most important sequences, the flag planting at 52:20, is superlative. You can appreciate the lunar surface’s texture at 1:09:12, fully resolved to give a great sense of what it is like. The blackness of space is powerful and rich, filling the 4×3 frame with a sense of nothingness and wonder. Brian Eno composed much of the haunting and truly beautiful themes to accompany these images, presented with flawless clarity on Criterion’s DTS-HD track. The theme from 2001 makes an appearance in all its glory, with fantastic power and fidelity. Narration can be slightly faded and a bit flat, undoubtedly the recording methods used varied. Still, nothing is overpowered or hard to understand. Thrusters or other engines firing deliver a nice jolt of bass, especially during the initial launch at 9:37, is fantastic. Stereo separation is aggressive, and the surrounds capture the movement of the flames into the rears with incredible accuracy. Director Al Reinert and Apollo 17 astronaut Eugene Cernan provide a commentary (recorded in 1999), followed by the feature Accidental Gift. This is a making-of that discusses the film footage itself, and how it was all put together. On Camera is a 20-minute collection of interviews with astronauts who flew into space. Paintings from the Moon focuses on Alan Bean, who painted numerous images after returning to Earth. 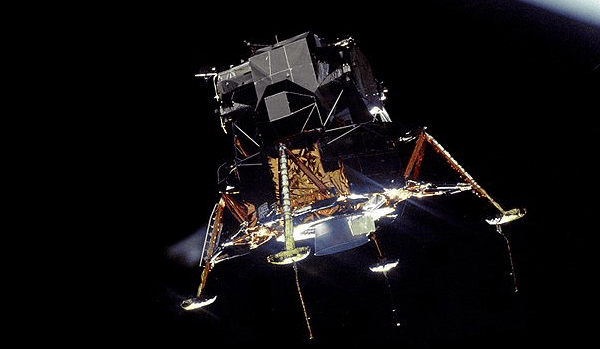 NASA Audio Highlights are memorable audio clips from the entire sweep of the Apollo missions. 3… 2… 1… Blast Off is footage of all the different rockets utilized during the program. Finally, you can choose to use a pop-up feature to identify the speakers during the film, which personally, takes a lot away from the experience.